Before we go any further, though, let me remind you that some of the links on this page are affiliate links, which means I may receive a small commission if you click through and make a purchase. I only post products that I have used and actually recommend. I’ve marked any affiliate text links with a * for easy identification. We can’t force our children to love Jesus. We can’t coerce our kids into true respect for God. Those things will come in time with the work of the Holy Spirit. The best we can do is provide positive God-encounters, daily immersion in Christian life, and prayer and encouragement (from ourselves and the other members of our villages who are setting great Christian examples). Family worship alone will not be enough to lead your children into personal, saving relationships with Christ. If realities of daily family life are constantly contradicting the lessons and principals you’re talking about during devotions, devotions may even end up being a negative influence on your child’s long-term spiritual health. Kids thrive on connection (actually all humans do), and if your worships are disconnected from the way you’re actually living life, they will not make sense to your kids. You’ll be running the risk of teaching them what many frustrated young people have already concluded: that Christians are hypocritical. I’m not saying you need to be perfect. We all fall short of the spiritual example we should be setting, at times. God will give us the help we need to teach by example if we ask. We all need forgiveness and grace. But if you’re trash talking the neighbors all day, and preaching about loving them for 5 minutes before bedtime…well, you see what I mean. Parents, let’s pray, practice, and then preach. Keep in mind that, while I’ll give you examples of how we do worship in our home, these examples are not meant to be prescriptive. You will need to be intentional about planning a worshipful experience that works for your family, your schedule, and your space. Each night we gather in one of our sons’ bedrooms, alternating between them (much to my oldest’s chagrin) to make it fair. All four of us sit on the floor together, and we read a Bible story from one of our favorite books. If we have visitors, we always invite them to join us for worship (or enjoin us, as E usually says). Obviously you can have worship in any room of the house, but since ours is part of our bedtime routine, we keep it to the boys’ bedrooms (unless we have a lot of guests, in which case we use the living room). If bedtime works for you, great! But maybe early mornings are better for your family. It really doesn’t matter where it is in the schedule, as long as it’s in there. Once you’ve chosen the time and location, set yourselves up for success by turning off tvs, putting away distracting toys, etc. When your worship area is settled, you’re ready to move on to the next step. 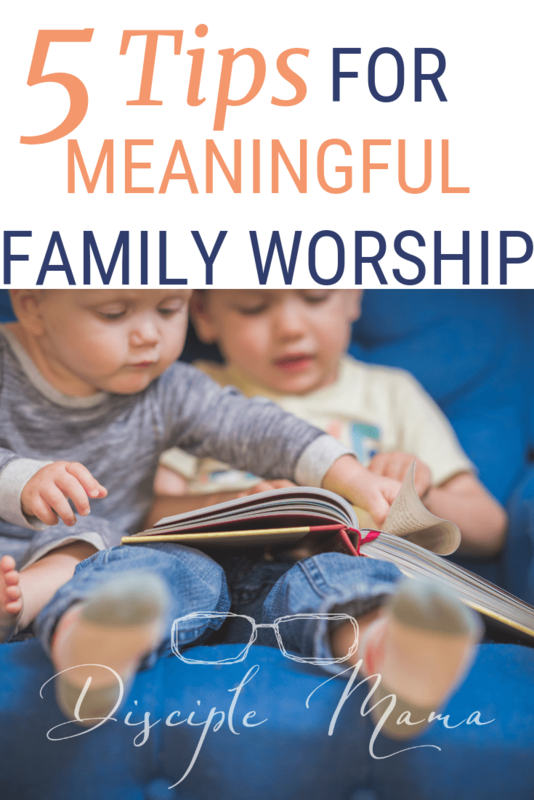 It’s not enough to have family worship once in awhile. Of course any is better than none, but in order to gain its full benefits, family worship needs to become an integral part of the routine. To accomplish this, you’ll have to make worship a priority. Try not to skip it! If you can stick with the time you’ve chosen every day, it will be a lot easier to form a worship habit. Of course there are times you’ll need to be flexible, but it’s better to move worship (or even shorten it) than to miss it altogether. Tell your kids why there’s a change in the schedule, and let them know how important family worship is to you, especially when life is crazier than usual. We choose shorter stories on evenings when our schedule is cramped or if the boys are just too tired to sit through a longer one. Often we choose one story from Bible Stories for Little Ones: A Frances Hook Picture Book * when we’re short on time. It was a gift to us from a friend and it’s full of stories about children in the Bible, one story per page, short and sweet! Since my husband is a pastor, he doesn’t have a regular 9 to 5 and he has to miss our family worship time more often than we’d like, but we worship without him. Even if you’re a parent down, make worship a can’t-miss part of your day. In fact, I’d even go as far as to say that if you and your partner are away from your kids you should leave them with someone who will keep family worships going in your absence. It’s that important. Okay guys, this is where the rubber really hits the road. 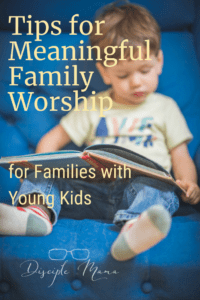 In my research on the best way to structure family worship experiences, I’ve realized that making family devotions relational for every participant is a key factor in making worship a positive experience for kids. (source) In our home, I’d have to say that we need to step up our game in this aspect of family worship. Family worship is much more effective for forming lasting relationships with God when you make it a relational experience for everyone involved. Bible stories are great, hymns and songs of praise are wonderful, but for family devotions to be truly meaningful, there needs to be a component of personal sharing and real-life applications of spiritual lessons. As a former teacher, this makes perfect sense to me (Bloom’s Taxonomy, anyone?). If we can understand a concept (spiritual or otherwise), digest it, and apply it to our own lives, then we can begin to produce something new and unique from our understanding. Briefly discuss the day and forgive/ask each other for forgiveness as necessary. Share personal prayer requests and answers to prayer. Discuss a biblical lesson or principle that was helpful or meaningful during the day. Part of making family devotions relational is ensuring that what you’re doing fits the range of ages and attention spans in your family. 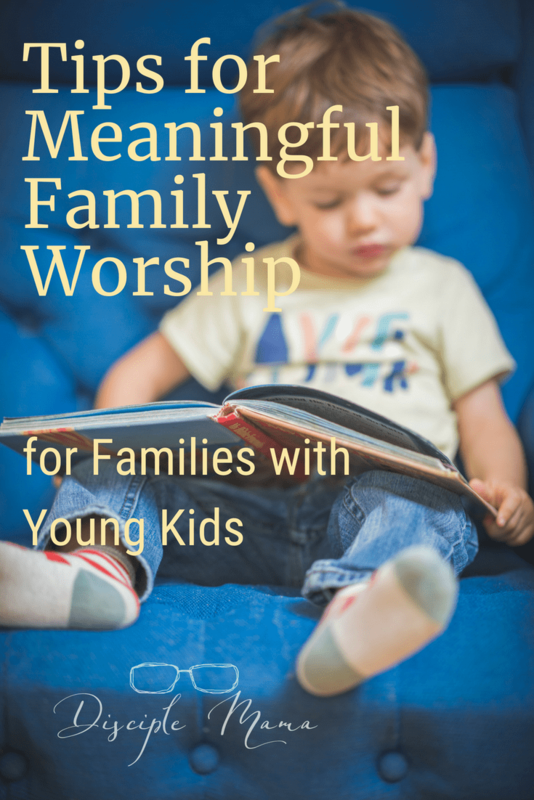 Family worship with young children should take as much time as needed, but no more. This is not the time for lengthy Bible commentary and an in-depth reading of the book of Revelation. Share and discuss for as long as participation is enthusiastic, and then wind down. There’s no need to ‘dumb things down’ for kids, but do make it kid-friendly. If you want to read the stories straight from the Bible, that’s great! Choose a version that uses language your children will understand, and choose stories or verses they can relate to. We use Bible story books for our family worships, and read straight from the Bible during our personal devotion times (more on this in another post). Don’t worry about trying to fit everything in to your worship time every single day. We have found that 10-15 minutes works best for our toddler. Since we have an infant now, too, we try to keep it closer to that 10-minute mark (or even less). We usually start with a story, then talk about praises and prayer requests, and pray together. I know families that always start or finish with a song, and I’m not even sure why we don’t! (We do a lot of singing throughout the day, though, so worship songs are a big part of our lives.) Again, do what works for your family here. Just keep in mind the shortest attention span in the family, and try to keep your worship to something that will work for that person. However you customize your worship, make prayer an important part of it! It’s vital that we teach our kids to pray, because there’s no better connection to God than through prayer. There are so. many. methods. for teaching children to pray, and honestly we haven’t used any one method. We’re focusing on teaching our kids to pray for what’s on their hearts, thank God for things, and to ask for forgiveness when they’ve done wrong. Does my toddler pray perfect prayers every time? Nope. But he’s comfortable and confident to go before God’s throne in prayer, and that’s more important than great oration or remembering all the steps of a prayer acronym at this point in his life. 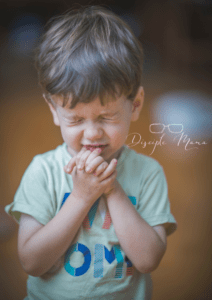 One thing I would say is that, while memorized prayers can be nice (and easy) for children to learn and say, I would be cautious about using them as the primary means of teaching your kids how to pray. Prayer is for pouring out our hearts to God in friendship. Teaching our kids to talk to God about what’s on their minds in the moment is crucial in forging their personal relationships with Him. If they can’t think of anything to say, sometimes it helps to pray one sentence and have your child repeat it until your prayer is done. That’s great practice for them to learn how to do it on their own down the road, and in my opinion, it’s a lot more practical for spiritual health than memorized prayer rhymes. Don’t always tell them what to say. 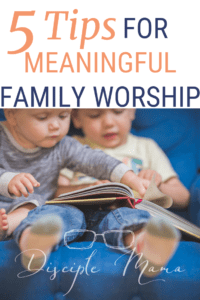 The final tip for successful family worship with small children is to let them take the lead. Obviously I don’t mean that you should totally hand over the reins, but let them make decisions and lead out in various age-appropriate ways. Our 2.5 year old son, E, is often (but not always) allowed to choose which Bible story we read for worship. His absolute favorite worship story books are the ones in the My Bible Friends (5 Volume Set) *. The end goal is to help kids to form a lasting relationship with God through these family devotional times. and giving them ownership of the experience is key. Our kids can’t get by on our relationships with God. They must form their own. That means we have to let them start, at an early age, to be leaders for Christ. Will they make decisions that we wouldn’t? Yep. Will they always pray beautifully or lead as reverently as we’d like? Nope. But that’s part of learning. As parents, we’re here to offer support, guidance, and prayerful counsel to our kids. We’re here to set an example and help them to follow it. Loosen your grip on the reins a bit, and let the little ones come to Jesus in ways that make sense to them. I hope you’ve found some helpful tips for your family devotions in this post. If you think there’s valuable information here, please share it! If you have questions or comments, please feel free to leave them below. Don’t want to miss anything happening at Disciple Mama? Sign up for our newsletter! I’d love to hear from you if you make any changes to your family worship routine based on this post, or if you have something exciting to add! I love that you spend time with your family doing a devotional or family worship. It is a great thing to focus on Christ daily. The Bible is so clear on training up our kids so they will not depart from it. It’s something to look forward to as a family every day! We DO need to keep our eyes on Him, and teach our kids to do the same. This is a wonderful post. Great tips! Thank you! That’s fantastic to hear! Family worship is such a great part of the day, isn’t it?! Those are great tips, thanks so much! I have a 6 month old and would love to do family worship with her, especially as she gets older. I believe it is so important to not only tell her to worship, but live it out with her as well. Yes, it’s so important for us to follow through with what’s truly important. Kids learn and listen so well, even at such a young age! It’s been incredible to see what my sons have taken in from worship already in their short lives. Thank you SO much for this beautiful, practical post! Worship is such a vital part of a healthy, Christian family… I really appreciate all of your practical (and personal!) input on so many aspects of worship time! Wow, I love this! You have such a good handle on what is needed to grow as a Christian family. At the same time you are being sensitive to age and development as well as the fact that we can’t give our kids a relationship with Christ, but we can give them the modeling, tools and skills to help point them toward Him. I loved your clear descriptions and Bible resources. I agree about the issue of teaching how to pray rather than teaching prayers to memorize. May God bless you, your family and your exceptional ministry! Hi Melissa, I’m so glad you enjoyed the post! God bless you, too! Brianna, thank you for reminding us the importance of modeling! I remember when my girls were really little, they would incorporate praying into their role playing with their dolls. I think I still have a picture of their stuffed animals huddled in prayer. 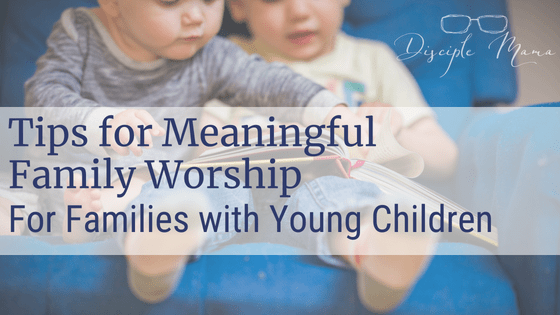 Kids absorb, both the good and the bad — so to model prayer, worship and have them participate is an important part of their spiritual development. Luisa, what a sweet photo that would be! I’m so thankful to my own parents for modeling prayer and worship to me, and for always involving my sister and I, even from an early age. I am sure it had a great influence on the development of my own worship habits, and I hope to instill the same habits in my boys! I love everything about this! Pinning right now. The reminder that no amount of scheduled devotions will undo what you are modeling to your kids every day is priceless! Consistency is both key and one of the hardest things about parenting. Hi Susan, you’re exactly right about consistency. If only it was easy!! But yes, I’ve found that my 3 year old can smell hypocrisy a mile away, so we do our best to live what we preach, and confess when we mess up. Thanks for reading and pinning! What a beautiful list. Our kids are grown now. I wish we would’ve worked a little harder at devotional time, but I’m thankful that the kids were raised to have a relationship with the Lord. Any way is better than no instruction at all. Thanks, Wendy! There’s always something we can improve on in parenting, but we do the best we can with what we know at the time, right? Just having devotions together is so beneficial, but it does require commitment and consistency! Thanks for visiting my blog today! This is very practical and valuable information for parents – Thank You! I think my new motto is going to be: Pray, practice, and then preach. Jamie, I’m so glad you appreciate the post. We could all do well to remember to pray, practice, and preach (in that order). I wrote it, but I still need reminding more often than I would like to admit. Thanks for visiting my blog. Come back soon! I wish I read this article when my daughter was younger. She is 15 right now. Thank you for putting so much thought and research into this post. Hi Galina, it’s not too late to start with your daughter! Thanks for visiting my blog again! We have been doing a Bible story or so before bed, but haven’t put the intentionality into it like we should. Thank you for putting your routine here and explaining the significance of it! As parents, there’s always something we can be doing with more intentionality, right? It’s awesome that you’re making family worship a habit early on! Thanks for visiting my blog again, Jessie! Bob, my boys love it when their grandparents can be here for family worship time! I’m sure your grandkids feel the same way! It’s so special to share that special time together. Thanks for sharing! Sure, family worship is essential to a good life. You have a clean design on your blog; I like that because so many blogs are filled with all kind of stuff, which is only distracting from the main message. Your blog is not like that. My favourite tip was number 2 – turn it into a habit. Edna, making a habit seems so easy when it’s a negative thing, but really GOOD habits seem harder to form. 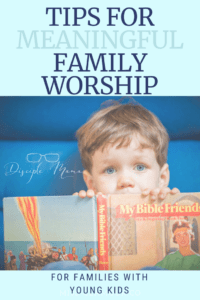 But, being consistent in family worship is actually really a lot of fun, so we really try to keep that time sacred in our family. Thank you for your kind words about the design of my blog. I enjoy a clean layout, too, because I think it’s a lot easier to focus on a message without a lot of distracting elements. I’m glad you took the time to visit my blog again! Come back anytime! This is a great post! We also make it a priority to have family worship with our kids everyday, morning and night. I just wanted to share something we enjoy for our morning worship. As we gather at the breakfast table one of us will share a special verse. Every day, we rotate who’s turn it is to share. They tell us why they chose it and we discuss the meaning and how it relates to us. Then, we sing a selected hymn or song of the month! We’ve learned all the verses of many songs this way. We all love it and many days it has brought a cheerful atmosphere in to our home and beyond. Even our four year old has learned to harmonize through singing these hymns. I’m glad you enjoyed the post, Ashley! I absolutely LOVE your morning worship plan! I heard your little one singing in Sabbath school yesterday and I was really impressed that a four year old knew all the words of the hymn. What a beautiful voice, too! The idea of having a hymn of the month is so great! Thanks for visiting my blog this morning!